Data munging (or Wrangling) is the process of data transformation into various states so that it is easier to work and understand the data. The transformation may lead to manually convert or modify or merge the data in a certain format to generate well-defined streams of data which is ready for consumption by the data analysis tools and techniques. You don’t have to be working in data science very long before you discover the importance of SQL. We can refer to the Kdnugget Software Poll, the top analytics, data mining, and data science software used in 2015 and look at the SQL’s place. In the survey of data professionals, SQL is placed third in terms of its usage. It’s also the first database tool on the list. Now, you see that R is right at the top. SQL is further classified into Data Manipulation Language (DML) and Data Definition Language (DDL). These commands are used to work with data-sets more efficiently. We’ll take a look at DML commands at later part of the article. Now, let’s discuss and analyze some of the SQL commands and understand why data-scientist needs to know these commands to do their work efficiently. In most cases, a majority portion of their work is about data gathering, data preparation, data cleaning, and data restructuring. After the data preparation phase, the scientist can move forward with the data analysis. In some scenarios, it’s been assumed that about 70% to 80% of the time on the data science project is spent on data manipulation; if this is the case then most of that time is spent working with SQL queries. As a basic principle, whenever we start working with a new data set, it is recommended to spend more time to understand the type and nature of the data. For example, one couple of data-sets may use abbreviations for departments and in some other datasets it may spell out the full name. We need to reformat data to get it into a consistent format. CONCAT The CONCAT() SQL string function is used to concatenate two or more string Concatenate strings ‘SQL Shack’ and ‘2018’ to SQL Shack 2018. TRIM The TRIM() SQL string function is used to remove blanks from the leading and trailing position of the given string In the following example removes spaces from before and after the word SQL Server 2017. RIGHT The RIGHT() SQL string function is used to return a specified number of characters from the right side of the given string The following example returns the 4 rightmost characters of the word SQL Server 2017. LEFT The LEFT() SQL string function is used to return a specified number of characters from the left side of the given string The following example returns the 10 leftmost characters of the word SQL Server 2017. REPLACE The REPLACE() SQL string function used to replace all the occurrences of a source string with a target string of a given string Replaces the string ’vNext’ with ‘2018’. TRANSLATE The TRANSLATE() SQL string function is used to perform a one-to-one, single-character substitution of a given string In the following example the string replacement is performed using translate function. REVERSE The REVERSE() SQL string function is used to get a mirror image of the given string The following example returns the word with the characters reversed. LEN The LEN() SQL string function is used to determine the length of the given string excluding the trailing blanks The following example selects the number of characters with an exclusion of the trailing spaces. 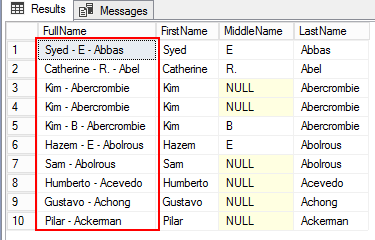 DATALENGTH The DATALENGTH() SQL string function excludes the trailing blanks in a given string. If this is a problem, then use DATALENGTH SQL string function which includes the trailing blanks. In this example, the trailing blanks are also considered while evaluating string length. CHARINDEX The CHARINDEX() SQL string function is used to return the location of a substring in a given string. In the following example, the starting position ‘Shack’ of the first expression will be returned. PATINDEX The PATINDEX() SQL string function is used to get the starting position of the first occurrence of given pattern in a specified expression In the following examples, ‘%’ and ‘_’ wildcard characters are used to fin the position of the pattern in a given expression. PATINDEX works just like LIKE operator but it returns the matching position. Example 1: In the below example, a part of given string “Prashanth Jayaram” is extracted dynamically using LEN and SQL Server SUBSTRING functions. The following example returns a character string created by deleting 6 characters from the first string, SQL Shack, starting at position 5, at Shack, and inserting the second string ‘Demo’ at the deletion point. STRING_AGG The STRING_AGG() SQL string function is the an aggregate function used to compute a single result from a set of input values The following example returns the names separated by ‘-‘ in a single result set. STRING_SPLIT The STRING_SPLIT() SQL string function is used to splits the input string by a specified separation character and returns the output split values in the form of table SQL Server 2016 introduced a new STRING_SPLIT table-valued function. In an earlier version, we used to write function, CLR code to decode the values. CONVERT The CONVERT() SQL string function is used to convert an expression from one data type to another data type. The CONVERT SQL string function accepts in a style parameter which is used for formatting the SQL output Implicit conversions do not require either the CAST function or the CONVERT function. Only explicit conversions require specification of the CAST or the CONVERT function. When converting a value from float or numeric to an integer, the CONVERT() SQL string function will truncate the result. For other conversions, the CONVERT() SQL string function will round the result. CAST The CAST() SQL string function is used to convert an expression from one data type to another data type. Convert an expression from valid date string to DateTime. In the following example, the DateTime type is converted to another varchar type. STR The STR() SQL string function converts a numeric value into a string The following example converts an integer to character string and concatenate the value with the first string. The use of the WHERE and HAVING clauses in a SELECT statement control the subset of the output from the source tables. Regular expression search is based on patterns, wildcards, and special characters. Even if you never ever write CLR, regex (as it’s also known) can be useful to you today, right now. Open a new query window in SQL Server Management Studio. [^…] Matches any character not within a specified range The following example returns the values whose first characters are unknown; second-and-third character is ‘im’ and fourth character that matches not within l to Z range. This article is an effort to showcase the available SQL string functions to manipulate the raw data to make it more meaningful data-set for the data scientist to perform the data analysis using SQL Server. Hopefully these SQL string functions can save you both time and money!